Service – A partnership with our customers through open communication, honesty, and trust. Appreciation – Understanding and recognizing the qualities of every customer and employee. Value – Every piece of the business is held at high importance and is beneficial to our success. Assurance – A commitment that every part exceeds customer satisfaction. Gratitude – Thankful for every individual and opportunity in our path. Excellence – Striving for recognition as the superior manufacturer. To provide world class machining and assembly of products and services to our customers through our values of excellence and innovation among its culturally-diverse employees and considers its customers, contractors, and suppliers to be partners working in the interests of safety, quality, and performance. To maintain a high level of quality in our processes and products that eclipses industry standards which will implant trust from our customers and ultimately help them to accomplish their long-term goal. The Wylie Fire Department visited Savage to train our Safety Team on Fire Extinguisher Safety. We were able to put our training to use and practice putting out a fire with the help of Wylie firefighters. Thank you Wylie FD for all you do and taking the time to teach your community. 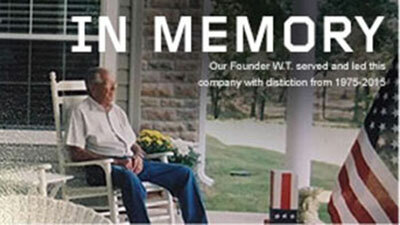 Born during the Great Depression and growing up in one of the toughest economic times to date, W. T. learned a tremendous amount of information about how to build people up, succeed in business, and turn a profit with a lot of hard work. Upon graduating High School he immediately left for the Army where he served two years in Germany. Returning to the U.S. he took a job at a Ford Plant and was later laid off due to economically hard times. With a wife and burning desire to succeed, he applied for a position as a machinist with Temco – not because he knew how to run a mill, but it paid a nickel more, and he knew that was a better position for him. In 1960, W.T. was hired by Texas Instruments, Inc., there he further developed his precision machining skills and was promoted to foreman over the non-metallic shop. After 15 years with TI he decided to start his own business. So in 1973, W.T. bought his first used Bridgeport Mill, saw and lathe and set-up a small machine shop in his garage. For two years he worked days as a foremen for TI and during the evenings and weekends as a budding entrepreneur. It was 1975 when he chose to leave Texas Instruments and move his little shop from his garage to a small location in Garland, and Savage Precision Fabrication, Inc. was born. As the sole shareholder and Native American Indian of Choctaw decent, W. T. has over 45 years of business experience in precision manufacturing operations. W.T. left his legacy to his Savage Family in 2013, where his loved ones and valued employees continue to honor him daily by doing “whatever it takes” to deliver a superior quality product, on time and within budget. Copyright © 2018 Savage Precision Fabrication, Inc. All Rights Reserved. Your contact information will not be mishandled, resold, or used for any outside purpose.